Injection piers are innovative, dual-purpose tools that foundation repair specialists use to repair foundations that have settled due to weak underlying soil or sinkhole activity. Typically placed 3 to 6 feet apart, they can be used to stabilize a house. Combined with hydraulic jacks, they allow a foundation to be raised to its original level position. In addition, injection piers allow grout (aggregate-free cement) to be forced into the soil around the piers. In effect, injection piers combine foundation underpinning with soil compaction. Contact us today for an estimate on grouted injection pier system installation in Tampa, Orlando, Saint Petersburg, Bradenton, Lakeland, Sarasota, Ocala, Kissimmee, Daytona Beach, Clearwater, Largo, Melbourne, New Port Richey, Port Saint Lucie, Vero Beach, Fort Pierce, Spring Hill and the surrounding Florida area. What is an injection pier? Injection piers are available in a variety of designs and sizes, but in general they are rugged steel pipes that can be driven deep into the ground. Heavy steel brackets mounted on top of the piers are fitted under foundation footings. The pipes are perforated at the bottom 8 to 16 feet so that after the pier is installed to the required depth, debris can be flushed out with water. Then grout can be forced down the pipe and out of the perforations into the surrounding soil. Grouted pressure underpins are typically hydraulically driven to just above the limestone bedrock. When grout is injected, it helps to seal off the underlying limestone from water and further erosion. In addition, grouted pressure underpins support the structure and compact underlying soil. Helical injection piers are screwed rather than rammed into the earth. They are installed only as deep as necessary to achieve the required resistance. Grout is then injected through the pier to consolidate the surrounding soil. Grouted auger piers are used where dense or non-porous soils are encountered and drilling is required. These piers are used to bore down to the top of bedrock or to load-bearing strata. Then grout is injected to stop further erosion and to stabilize the surrounding soil. 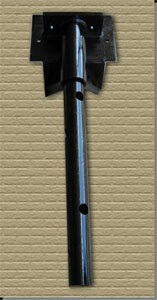 Injection Piers are underpins that have several 1 ½” openings in the steel casing. The perforated pipe allows L.R.E. to pump grout through the casing to permeate the soil surrounding each pier. This gives the underpins more stability and enables L.R.E. to compress and compact soil around the pins. Prep foundation for installation of bracket assembly. Using a hydraulic ram, hydraulically advance the pier to competent bearing strata. Using water, flush the inside of the pier to clear out any debris. Pump grout through injection piers. Maintain a clean worksite each day.